This is fast moving news, without any one article encapsulating all the latest, but these links should bring you up to date on all the craziness out there. The demon-rats are squealing now so I believe that Trump is really hurting them. Even the fat boy from New Jersey is crying that the GOP is being hurt with the child separation act. When he was hugging Obamy on the beach did he whisper that in his ear....you can really hurt the GOP by separating the children? 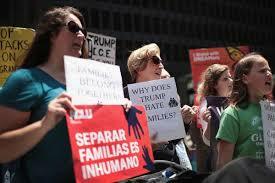 No child would be separated from its parents if the parents stayed home, in their own country, or stood in line to enter the USA. But the demon-rats and the RINO's have instituted a stupid law which makes all of this possible. It is the Trump administration which is trying to straighten out this mess. Yes, Mrs. Bush your husband what one of those who thought this was a great idea. The parents and children know what is going to happen when they leave El Salvador, Honduras or wherever they are coming from. They know if they can illegally cross the children that the children will become "anchors" that will eventually draw the parents in. It is a premeditated plan on their part. The liberals are turning it into a drama in hopes of swinging votes in the midterm election.